Bringing a taste of something tropical to the heart of London and the UK, our range of orchids will delight and excite in equal measure. With online ordering safe and easy, you can have any of our selection of plants on your doorstep within 24 hours. With a service that snappy, why wait? Orchid plants are quite diverse flowers. They come in all shapes, colours and sizes and their species types run into many thousands. Many orchids are quite colourful and fragrant and carry quite a few flowering plants too. Among the most popular orchids in our London florist are cymbidiums, phalaenopsis, vanda and dendrobiums, which are sometimes called Singapore orchids too. Our lovely florist usually use orchid plants and flowers to create some of the most luxurious types of flowers and plant arrangements hat one may have seen ever. For example, it has been often the case lately that we have used vanda orchid heads to create stunning flower bouquets and we often love using these with hydrangeas, roses and amazing foliages. Send your orchids to London or UK on our same day or next day flower delivery service. If you choose to send orchids to London, you can do so very late on and can order up to 6 pm seven days a week in order to receive your orchids plant or flower arrangement. Interestingly enough orchids like a variety of temperatures and one should always think before choosing a position to place them in your house. For example, after you receive an orchid delivery from our London florist, it is best to keep your plant in an unheated room if it’s a cymbidium plant as when they are placed in a warmer temperature their flower is often reduced greatly. On the other hand, if you receive the ever popular phalaenopsis orchid from our London florist, it is very much advisable to place it into an indoor condition where the minimum temperature is around and at least 18 degrees. Most orchids, as far as we are aware, require or prefer bright but filtered light – meaning that direct sunlight is not always advisable, but light always is. Our flower delivery drivers usually get best comments from our esteemed customers who place their orchids on kitchen window stills in the corner with plenty of light, but no direct sun light. Great thing about this position is that it offers high humidity and one often remembers to water them once a week here too (ideally only once) as the water is often next to them as well. In the winter months watering should be kept to a minimum however. Whenever you receive a delivery of orchids in London from one of our florists and you are not sure how to take care of your flowers and plants, just give us a call and we will be more than happy to help. Our florist educated operators are also next to our London florist headquarters and where most of the online flowers are made, so whenever they do not understand anything, we can always bring a senior florist in. When you send orchids to London with Flower Station, you can do so in the knowledge that all our orchids are fresh and of best quality available. From over one metre phalaenopsis orchids to amazing vanda plants in glass vases – we have it all. What’s more is that each and every one of your orchids delivered can be hugely optimised and mixed with all our other plants and flowers that our wonderful London florists have to choose from in our stores. We also do not just store the usual colours of pink and white, but often carry more unusual purple orchids, yellow orchids and even purple orchids. And unlike supermarkets and standard flower shops that tend to sell phalaenopsis types only, we also love to carry other types of orchids such as Vanda, dendrobiums and cymbidiums. 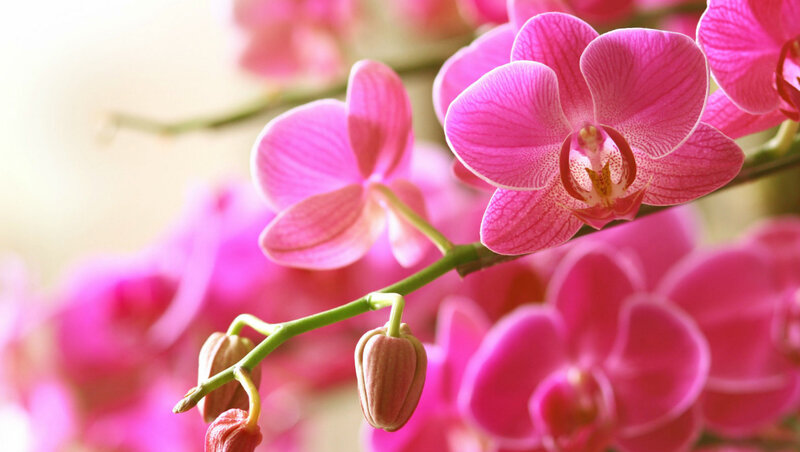 Our London florists are all knowledgeable and know how to handle the orchid plants. They are also experts in packaging them and especially in placing them inside some of the beautiful plant and flower vases we have on displays here. When needing a special orchid sent to London or UK it may be best to also give us a call and we will look to optimise your flower delivery, whether you wish to send flowers to London or UK. Sending orchids to London is truly getting easier and easier. Your orchids will arrive at the place of their destination just in the same condition as when they left our London florist – they would have been handled by expert florists at the beginning of their design and delivered by our wonderful flower delivery drivers to you, ensuring for maximum security of your package. Q. How long can I expect my flowers to last? A. potted plant such as an orchid will last indefinitely with the right amount care and attention – make sure to provide the right amount of water (don’t over feed) and always keep away from excessive cold. Q. What are the most suitable flowers for a Mother? A. While it is always to a certain degree a matter of taste, a potted plant has the added value of lasting well beyond the particular occasion and serving as a poignant reminder of the gesture.